What a start to the week! After such miserable weather this weekend DeVotchKa have arrived to add some flavour to our weeks at the very purple 93 Feet East in the heart of Brick Lane. The venue was packed out early on and we even spotted Justin Hawkins hiding amongst the crowd with long haired friends. Opening for DeVotchKa was an unusual surprise for the crowd, not the cabaret or burlesque that we're used to seeing alongside DeVotchKa. Bursting on to the stage, in luxurious women's underwear all round, were Paul St Paul and the Apostles, with a lead signer that has a vocal style and look crossed between Prince, Freddy Mercury and a pinch of Madonna. PSP performed their debut single "Let's pretend we're gay", "Vampire" and a few other songs with melodramatic goth-like lyrics to pop dance routines that were mirrored by their fans and 'burlesque-looking' street team on the dance floor and ridiculous guitar riffs. The entire performance looked like it was set in the Michael Jackon thriller video. We've no idea how much of the show was actually live but none the less it was catchy and amusing. The last time we saw DeVotchKa in town they were an opening act for the Dresden Dolls; since then they've been continued to develop their style and received a Grammy nomination for best soundtrack after their fantastic performance for the award-winning Little Miss Sunshine. DeVotchKa got off to a bit of slow start with some of their older material and then completely wowed the crowd with the the popular "How It Ends" with great performance from violinist (and accordionist) Tom Hagerman and vocals from lead singer and guitarist Nick Urata. 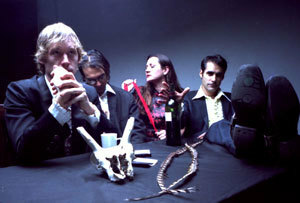 Moving swiftly from song to song, DevotchKa packed the night playing many of their popular songs such as "Til the end of time", "Queen of the surface streets", "The last beat of my heart" and, from the Little Miss Sunshine soundtrack again, "The enemy guns". After 45 minutes the band walked from the stage and then returned for an encore which transformed into another half-hour of adrenaline packed songs featuring a heavily Spanish and Cuban feel from their strong roots in Bolero and Mariachi music styles. Each of the members of DeVotchKa came into their own and it's a great thing that they all get their moments to shine: Jeanie Schroder taunted and teased the crowd with her giantantic flower-covered Sousaphone and upright bass, and Shawn King provided a strong backing for all of DeVotchKa's numbers on drums and percussion. If you can't get one of the shows to get the full live experience, their album "How it ends", with many of the tracks featured on the Little Miss Sunshine soundtrack, has recently been launched in Europe, check it out!